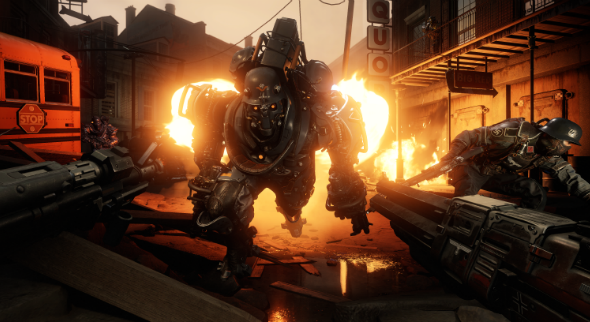 This article contains spoilers for Wolfenstein II: The New Colossus. 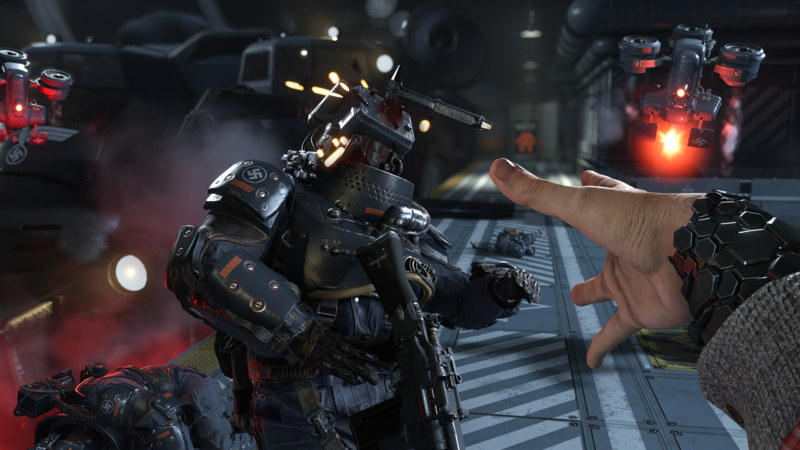 I dialled down the difficulty three times during Wolfenstein II’s campaign. Stop right there! I see your finger, feverishly hovering over the custom ‘git gud’ key on the pulsing, kaleidoscopic light show that you call a keyboard. Go and have a little sit down and come back when that fizzy feeling in your tummy has subsided. Want to get the maximum bang for your buck? 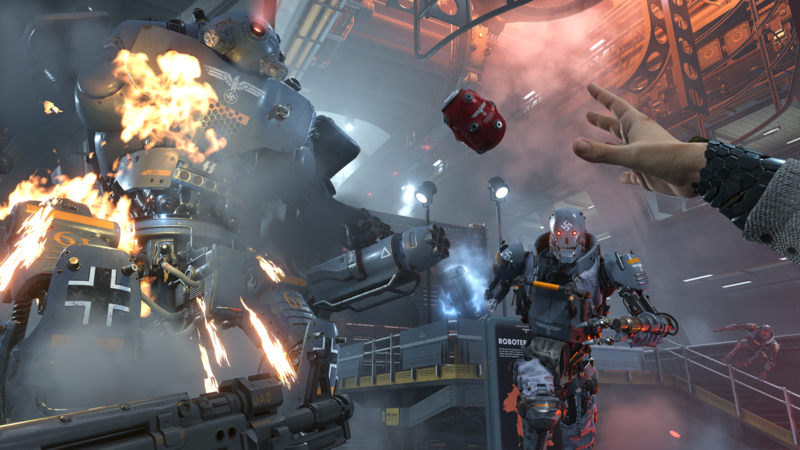 Read our guide to Wolfenstein II’s weapons. To the rest of you, still correctly standing in deference to my opinions, let me be clear: I really like The New Colossus. MachineGames’ sequel is dizzyingly pretty, its scripting uncommonly snappy, and B.J. Blazkowicz’s movement and weapons feel wonderful. But there is a problem: all that buttery, bass-laden satisfaction is undermined by the Nazi’s canny deployment of bullet-sponge technology – an attritional defence so effective as to dispirit even the most square-jawed of mumbling heroes. Y’see, I tend to start games a notch or two up from whatever the standard difficulty is, because I play a lot of games and need a harder hit these days to achieve the same high. You understand. So, naturally, I set out on my Nazi-killing rampage with the ‘Call me Terror-Billy!’ difficulty selected. Grrrr. I am excited – The New Order, after all, was a dream of a game for the most part, and I had already enjoyed The New Colossus’s opening mission and early Roswell levels during preview events. But I quickly regret my decision once all the dying begins. For the opening portion of the fightback, my health is set to 50 – an understandable shortfall given that the overworked Blazkowicz is feeling a little under the weather after the events which conclude the previous game. This, in combination with the brutal damage even grunt enemy bullets do to you, makes for a steep learning curve early on. And while most of the Nazi cannon fodder yield easily enough to the combination of my upgraded Sturmgewehr and charismatically-performed headshots, my gutsy balletics become stodgy bombardments as the size – and metal-to-flesh ratio – of enemies gradually shifts. You can tear off arms and turn the Lasergewehr, Dieselgewehr, and Hammergewehr against their owners, of course, but these booming boons are shortlived (and, ultimately, not particularly satisfying to deploy against foes that don’t burst into a cloud of spiralling cinders). In the absence of additional firepower, chipping away at the armour of an enemy that barely flinches feels charmless. It is when I reach the end of chapter two, and must stall the Nazis while Grace and the rest of the resistance escape, that I first give in to the urge to make things easier on myself. My assailants are numerous and supported by giant gnat-like drones – I am yet to encounter a flying enemy in a first-person shooter that is more fun to deal with than it is irritating. The bipedal aggressors also wield devastating firepower along with the ability to survive a questionable proximity to my grenades’ detonation. A handful of deaths later and even the combination of Blazkowicz’s swagger and the rousing heavy metal soundtrack isn’t enough to keep me enthused. Down to ‘Do or die!’ it is, then. Later, during the Roswell mission, I must fight my way out of a Nazi bunker. Cowering behind insufficient cover while taking occasional pop-shots at the enormous mech that is flinging mortar fire my way is akin to trying to shoot down a 747 with a handful of acorns and an especially weak throwing arm. I persevere – because I am just that kind of guy, a hero in real life as well as games – and eventually make the looming collection of far-right bolts and pistons explode. But, having restarted the scenario five or six times and only now realising that I could have just snuck past the blasted thing, the experience leaves me wearied and suspicious. Right then: ‘Bring ‘em on!’ still sounds quite tough, doesn’t it? This respite is enough for a time. Even the high frequency of ÜberSoldaten and Supersoldaten, along with the occasional Panzerhund and Zitadellen, doesn’t detract from all of the immensely satisfying opportunities to take a Schockhammer to the grunts (a phrase that could well become my new favourite euphemism). But then, out of nowhere, the infamous Courthouse level pops up to further test the limits of my appetite for restarts and piecemeal manual saving. 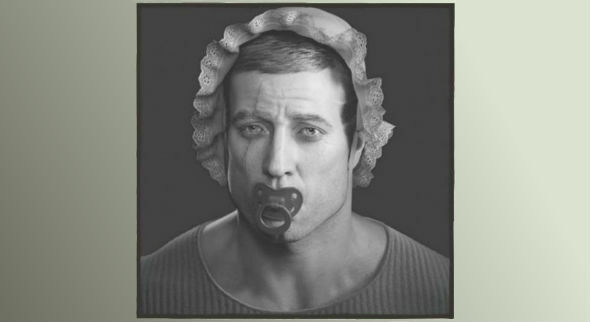 It is a fantastic, surprising moment in narrative terms, but what would otherwise be a moving exploration of Blazkowicz’s personal vulnerability is undercut by the tirade I embark on when his literal fragility is showcased so insistently. Oh good grief. Fine, I give up: ‘Don’t hurt me’. It is a breeze from here on out. Enemies yield to my bullets pleasingly quickly, I get to live out the power fantasy that I associate with embodying a gun-wielding beefcake five times my mass, and the game’s earlier uneven difficulty spikes seem to level out. I finally feel that Wolfenstein and I are on the same page regarding what constitutes fun, and wish I had made this decision earlier on. At least, that is, until I reach the pair of Zerstöreren waiting for me on Frau Engel’s Ausmerzer airship. I mean, talk about an easy boss fight. They barely present a challenge – I just smash them to pieces, laughing as I play with one hand and text my friends with the other. Barely even broke a sweat, mate. GG robots, EZ. I mean, come on MachineGames, is that all you’ve got?